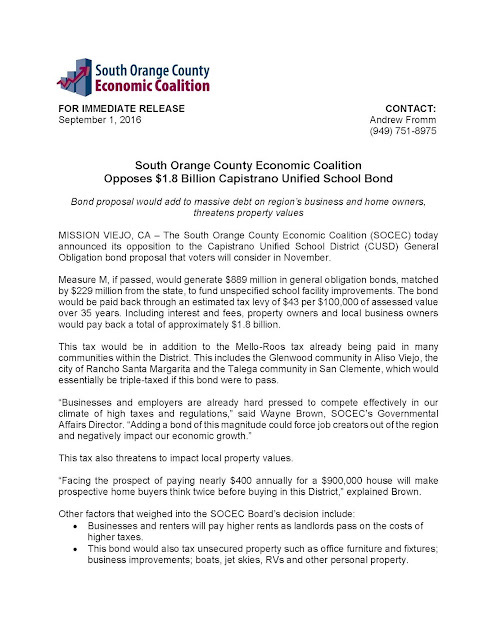 I would appreciate your support to return me to the Capistrano Unified school board. Area 2 contains 14 percent of the population within CUSD, but over 25 percent of the students! For this reason, public education is critically important in our communities of Ladera Ranch, Las Flores, Wagon Wheel, Coto de Caza, Trabuco, Eastern San Juan Capistrano and Rancho Mission Viejo (Sendero and Esencia). Area 2 communities pay the highest school taxes in CUSD and we enjoy newer schools. We should not be triple-taxed to support needs in older affluent communities. I opposed the district-wide school tax since its conception and recommend a "NO" vote on Measure M. A more thoughtfully-considered solution to the needs of older schools is possible. Thank you to the hundreds of people who I've met, and those who write with expressions of support and questions. Most of you want to talk about education, and not about taxes. I wholeheartedly agree. We should consider the needs of students first. Fight "election fatigue". Please take the time to vote! I am delighted to be endorsed by the OC Register Editorial Board following a thoroughly interesting interview last month. The editors believe that change is needed at CUSD. I could not agree more. 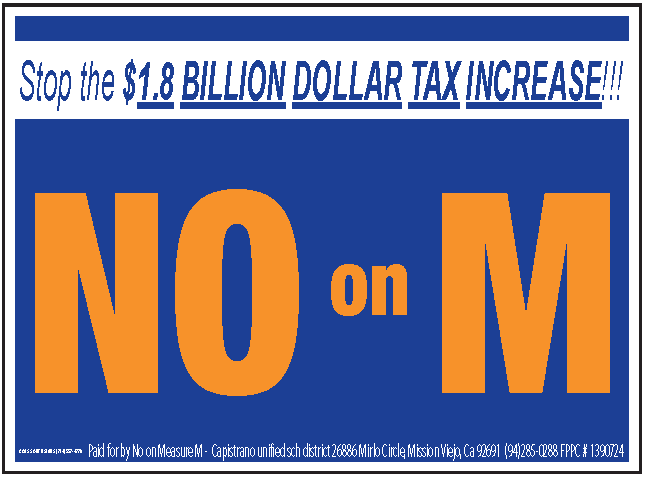 I'm also grateful for their opposition to Measure M, CUSD's $1.88 billion tax measure. 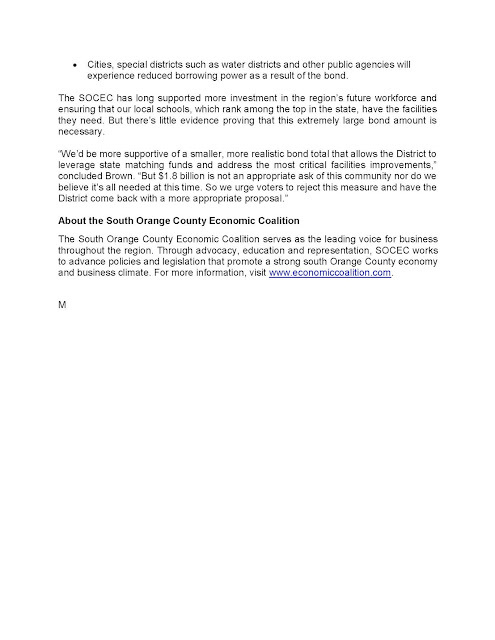 The South Orange County Economic Coalition has taken a position against CUSD's $889 million bond which will appear on the November ballot. Their Press Release gets right to the point. They point out that this form of borrowing will punish those who pay Mello-Roos taxes throughout the school district. Virtually every community along Antonio Parkway and La Pata is subject to such taxation already, including virtually all of the communities listed in the masthead of this website. I agree. I am urging voters to reject this bond and support the election of school board candidates who favor a more cautious and fair approach to meeting the needs of present and future students in our schools.